Geotechnical engineers can use this software for day-to-day analysis and calculations. Many correlations and formulas are recommended by geoscientists in order to estimate one soil parameter based on a series of known parameters. Database of formulas include common correlations such as Cc, Cs, CBR, Es, etc as well as mass-volume relations and formulas. All formulas with their equations are presented in NovoFormula and user can add new equation. Report and export to Excel features are available. This is a very handy software which should be installed on every geotechnical engineer's computer. 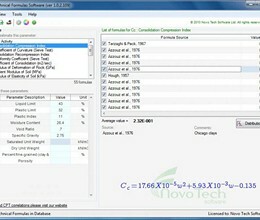 * NovoFormula download link provides trial version of the software. NovoSPT is a very handy app for all geotechnical, geological and civil engineers in order to correlate SPT blow counts to various soil properties. 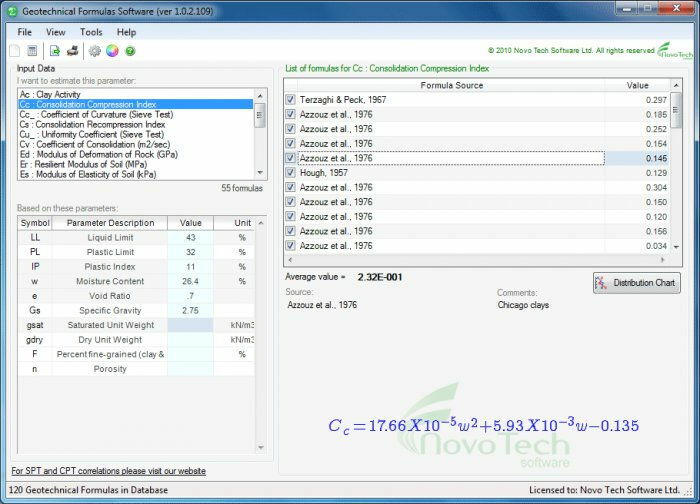 NovoSPT is a unique geotechnical software designed for correlating SPT blow counts (N) to various soil properties using 300 correlations. This robust software is designed for soil liquefaction analysis during earthquake and supports multi-layer as well as single layer stratigraphy. iNovoLIQ application is designed for soil liquefaction analysis based on Idriss and Boulanger, 2014 methodology. NovoBPT is designed for correcting raw BPT blow counts (Nb) and converting them to SPT blow counts (N60). NovoFormula has been rated 5.0 out of 5 points. A total of 2 votes cast and 0 users reviewed the software. AllPile is a Windows-based analysis program that handles virtually all types of piles, including steel pipes, H-piles, pre-cast concrete piles, auger-cast piles, drilled shafts, timber piles, jetted piles, tapered piles, piers with bell, micropiles (minipiles), uplift anchors, uplift plate, and shallow foundations. Dips is designed for the interactive analysis of orientation based geological data. PILEGRP is a spreadsheet program written in MS-Excel for the purpose of analysis of pile groups with rigid caps using the elastic method. Beam Foundation Analysis (GEMS) is a feature rich, easy to use finite element modelling software for beam foundations. SO-Unconfined is aimed at the evaluation of unconfined compression tests. It has a user-friendly interface and lots of smart capabilities are implemented. SO-Shear is aimed at the evaluation of direct shear tests. It has a user-friendly interface and lots of smart capabilities are implemented. SO-Sieve having a user-friendly interface, includes sieve analysis, hydrometer and Atterberg limits tests.